According to the United States Bureau of Labor Statistics (BSL), over 1 million non-fatal workplace injuries requiring days off occurred in 2013. 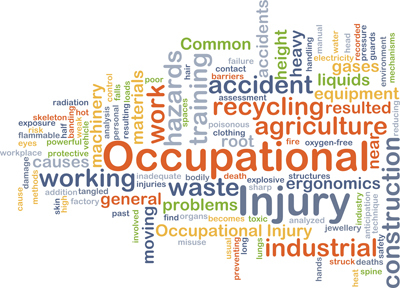 The total number of non-fatal occupational injuries overall in 2013 nearly broke the 3 million mark. Although this marks a decrease in incidents compared to previous years, at KBG we know that those numbers are far too high and we’ve seen the devastation workplace injuries can cause for those involved. In order to bring awareness to workplace injuries, we’ve decided to highlight some key statistics that paint a clearer picture of occupational injuries and workers’ compensation benefits. Every year Liberty Mutual publishes a study on the top workplace injuries and the workers’ compensation benefits that occur as a result. According to the 2014 report, the top 5 workplace injuries accounted for 65 percent of direct workers’ compensation payments in 2012. Overexertion – Both the U.S. BSL and Liberty Mutual point to overexertion as the leading cause of workplace injuries. These injuries involve lifting, pulling, carrying and throwing, and led to over $15 billion in workers’ compensation benefits in 2012. Workers in the manufacturing and construction industries are most vulnerable to injuries caused by overexertion. Slips, Trips & Falls on the Same Level – These injuries can be caused from slippery floors, poor lighting or misplaced objects and resulted in $9.19 billion in workers’ compensation payments in 2012. Falling Objects – Manufacturers and construction laborers account for most of the cases of injuries caused by falling objects. Injuries from falling objects are often head injuries and resulted in $5.3 billion in workers’ compensation payments in 2012. Falls from a Different Level – Responsible for $5.12 billion of workers’ compensation claims in 2012; falls from higher levels, such as ladders, most commonly occurred to laborers in the building maintenance, transportation and health care industry. Body Reaction ­– This category of injuries could be considered a catchall for work injuries and describes any injury that occurs due to motions of the body, including the body’s natural instinct to prevent a fall or trip. These typically result in muscle injuries. In 2012, injuries from this category contributed to $4.27 billion workers’ compensation payments. All businesses and organizations with more than 10 employees are required to report injuries by the Occupational Safety and Health Administration (OSHA). Most victims of injuries on the job are between the ages of 45 to 54. Most non-fatal injuries at work occur at businesses with between 50 and 249 workers. The most frequently cited safety violations by OSHA were due to: lack of fall protection, lack of hazard communications standards, regarding scaffolding, lack of respiratory protection and regarding powered industrial trucks. Workplace injuries can result in more than days off. Injuries can lead to job transfers or restrictions that can also limit possible income. If you have been injured at work, or have suffered retaliation from reporting an injury on the job, speak to a law firm with experience in workers’ compensation cases. KBG Injury Law is the largest workers’ compensation law firm in central Pennsylvania with attorneys who treat clients as people. Contact us 24/7.